Presswerk does modelling and is also very brainy. Far from your DAW's stock compressor, u-he's Presswerk will offer a huge batch of controls to carry out tasks from the mundane to the creative, and all backed up by the sonic experience of the developer behind Satin, Bazille, DIVA and so much more. The plugin (VST/AU/AAX) will be available to the public for beta testing until the end of the year. 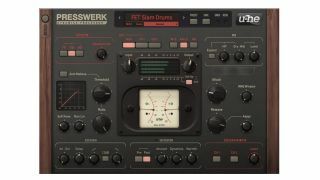 The plugin has a two focusses to choose from - one thoroughly on tweakable processing, and the other on vintage modelling, aiming to sate two of the biggest desires in compression with just one tool. So just how much control can you get? We have seen the plugin's basic compression features on other plugins before: there's a knob for setting the non-linearity of the ratio, the RMS Window control sets the timeframe over which the RMS level of the signal is evaluated, and a Soft Clip setting is in there too. All this can be set to work in stereo (L/R) or mid/sides configuration over the plugin's two channels, each independently configurable and linkable. Metering is on hand courtesy of VU-style and LED-style meters. Optical mode takes after hardware compressors of old (or 'levellers'), simplifying the settings and acting in a quirkier, non-linear way; FET (Field Effect Transistor) mode is another classic circuit model that goes down especially well on busses; and the Tube Limiter mode takes on 'variable-mu' compressors, useful for mastering applications. So Presswerk aims to both emulate the classics and to give you full-on control to dial in any character and response you're after. You can get involved in the Presswerk beta testing for the rest of 2014.